If you are looking for a vacation rental in Florida, this is it. This beautiful, cozy cottage is totally remodeled. It has laminate flooring throughout, bathroom totally remodeled with travertine wall and floor. The front has a new landscape with a friendly and a tropical feel. This 2 bedroom cottage sleeps 4 people plus a pull out sofa in the living room will sleep another 2 more people. The dining area has a double French doors that leads to a peaceful backyard. The back has couple of beautiful bottle brush tree, oak and palm trees. A 24 X 28 ft deck with a Tiki hut. A floating dock next to the new deck is available for you to dock your boat. You can bring your own boat. Free use of paddle boat and kayak. If you want to rent a boat, there are a number of marinas close by (within walking distance). The canal is only minutes away to the Gulf of Mexico. You can sit on the fabulous deck and enjoy your morning coffee/breakfast or have an enjoyable dinner out on the deck, with a beautiful view of the canal. 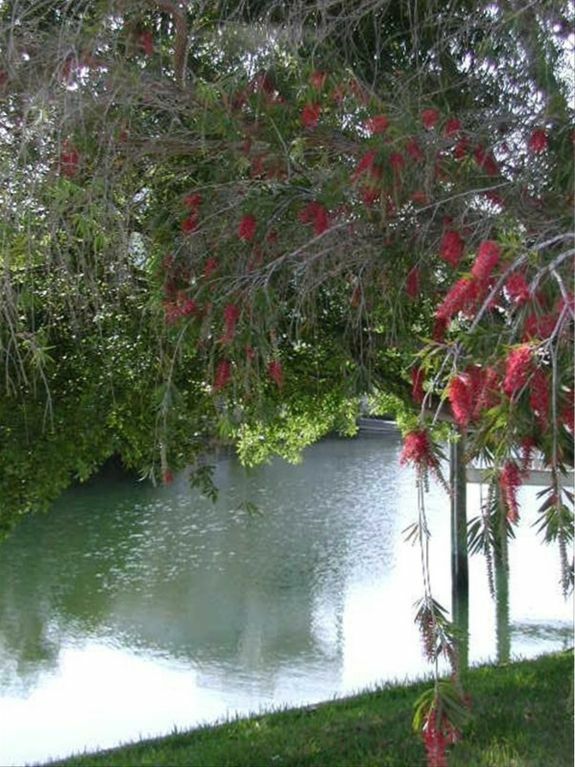 Sometimes you might get lucky seeing dolphins or manatee swimming in the canal right off the deck. Smoking is not allowed inside. Hudson Beach is very conveniently located. There are quite a few restaurants close by if you like eating out. There are 3 restaurants and a small local beach within walking distant from the cottage. If you enjoy singing, there is a karaoke nights at a local ice cream parlor close by. There are many restaurants and marinas, like Mike dockside, Port Hudson, Greek restaurant, Fisherman's shack and many more. Some of the world famous beaches are in Clearwater and St Pete which is to the South of Hudson and it's about 30 minutes away. You can go north to Weekee Wachi to watch the world famous mermaids show or go to Homosassa Springs to see the manatee or visit the historic city of Brooksville and Dade City. World famous sponge dock, Tarpon Spring is within 30 minutes away, a cute little Greek town with many great Greek restaurants. World famous theme park like Disneyworld, Seaworld, Bush Garden, Epcot Center, Kennedy Space Center are all within 30 minutes to 2 hours away. There are many other things to do close by like fishing, boating, sailing, sightseeing, antiquing, live theater, golfing, miniature golf, flea market, horseback riding, zoo/wildlife park, kayaking, water skiing, swimming, shelling and many more. We are always on vacation when are at the cottage. We love the beautiful area. Beach and restaurants within walking distant, boating, fishing walking, biking taking a great paddle boat out, just enjoying the canal and the gulf, watching great wildlife including the dolphins and menattee sometimes play in our waterways. Overall it is just a fabulous place, peaceful outdoor amenities where you can sip your coffee, enjoy your meals, cook on the BBQ and smoker that all our guests love and leave with a very memorable vacation. Some dvd movies. Get free movies from Netflix. Clean and well furnished/decorated home. Deep water to the Gulf channel for boaters. This house was perfect for our weekend scalloping trip. First the house is perfect! We had 6 people (4 adults and 2 boys 15, 13) and there was ample room for all of us. The bedrooms were clean and comfortable. The extra 1/2 bath was especially handy with that many of us. The place has a newer high-capacity Washer & Dryer which was helpful with all of our towels. The kitchen is completely stocked with everything you need. The very clean 4-burner gas grill fired right up. The house was immaculate. The best part was the covered deck over the water! It has lighting, fans, tables and chairs...we spent as much time as possible out there, eating and relaxing...even during the thunderstorms. The deep-water canal with the floating dock handled 2 boats and a jet-ski and it only took 5 minutes to get out to open water. There is a boat-ramp around the corner within walking distance. We put in, drove our cars/trailers back to the house and walked back to the boats then brought them around to the house...all in less than 30 minutes! There is a marina for gas and several restaurants all right there too. The owner was extremely friendly and responsive before, during and after the reservation. All in all, I highly recommend this property if you are planning on boating in that area...the water off there is fabulous and so is this house! We had a great time. Very relaxing. We choose this house over staying in a hotel because of the comfort and privacy of our own house. The inside is very clean and cozy. It has a beachy feel and the master bed is really comfortable! We really enjoyed sitting out on the covered tiki deck. There are kayaks there to use but was really challenging to get in them from the floating dock, but we are ust to getting in them from shore. We stayed at this location to visit weeki wachee and did not want to stay in a hotel. Other than the park, there is not much to do around town but we knew this going on the trip. It was more for relaxation and visiting weeki wachee for the kids. The pizza parlor at the end of Clark st was good and then we visited the ice cream parlor to. There is Husdon beach close to the house that we visited and you can enjoy nice sunsets there. Our only issue with the house was the keypad to get in the house was a little finicky, kept having to redo the code. The buttons were sticking. Overall we really enjoyed our stay at the house and Kong Loo was very nice and quick to respond with any questions I had. This was our second February at this Hudson Beach cozy cottage. The location offers everything we need: golf for my husband, kayaking and bicycling for me, wonderful restaurants within walking distance, a cute little beach, and a great ice cream shop. There are many interesting sites to visit in the area also. The cottage is a perfect size for us and accommodated visits from friends during the month. Kong responded to a few problems that came up quickly and professionally. The beautiful deck is our absolute favorite place. We've already booked for February 2018!